As summertime begins in Melbourne, many of the smaller galleries finish their last exhibitions for the year before taking a long holiday, while the larger institutions are opening their summer blockbuster exhibitions just in time for the holiday crowds. This year is no exception. The Heidi Museum of Modern Art is presenting Jenny Watson: The Fabric of Fantasy, a large survey exhibition of one of Australia’s leading female artists. The National Gallery of Victoria is presenting the inaugural NGV Triennial, an exhibition focused on art and design in the Asia-Pacific region. The Australian Centre for Contemporary Art is presenting Unfinished Business: Perspectives on art and feminism a large group exhibition surveying a diverse number of artists within a feminist scope. Jenny Watson is a leading Australian artist whose conceptual painting practice spans more than four decades. Jenny Watson: Fabric of Fantasy is curated by Museum of Contemporary Art Curator Anna Davis and the survey features works from the 1970s to the present, including examples of Watson’s early realist paintings and drawings, and a number of key series of works on fabric. Many of Watson’s works feature self-portraits and alter egos, a cast of longhaired women, horses, ballerinas, rock guitarists and cats, who enact life’s ongoing psychodramas. Featuring the work of over 100 artists and designers from 32 countries, the NGV Triennial surveys the world of art and design, across cultures, scales, geographies and perspectives. The NGV Triennial is a celebration of contemporary art and design practice that traverses all four levels of NGV International, as well as offering a rich array of public programs to coincide with the exhibition. Ntozakhe II, Parktown 2016. Courtesy the artist and STEVENSON gallery, Johannesburg. 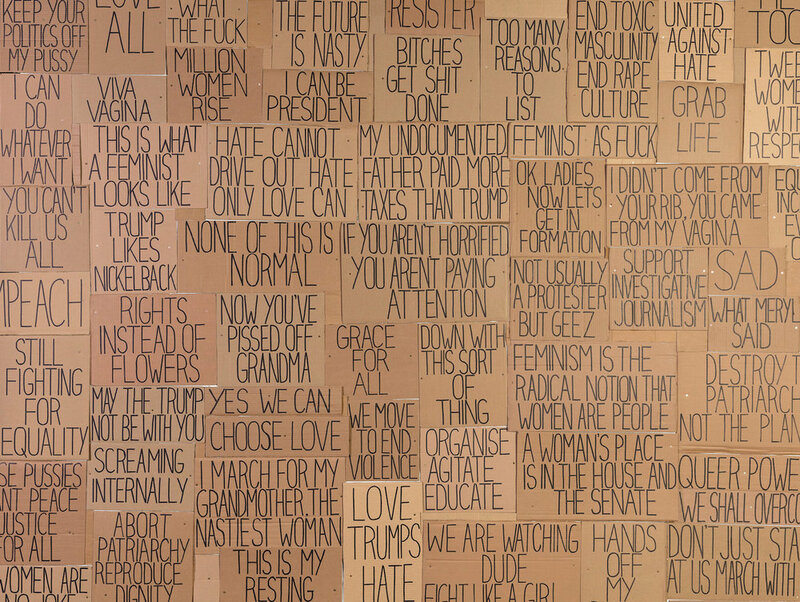 Asking why feminism is still relevant, necessary and critical, Unfinished Business is a major exhibition conceived to animate these discussions around a selection of artistic practices. Adopting a collaborative, polyphonic form which encourages diverse voices, practices and debates, Unfinished Business presents new commissions and recent work alongside selected historical projects, programs of film and performance, and a publication. The exhibition aims to stimulate new debates and discussions around the ‘unfinished business’ of feminism today. The curatorial team for this exhibition includes: Max Delany, Annika Kristensen, Paolo Balla, Julie Ewington, Vikki McInnes, and Elvis Richardson . Banner image: Jenny Watson: The Fabric of Fantasy, installation view. Book a tour with Charlotte in Melbourne to discover more!